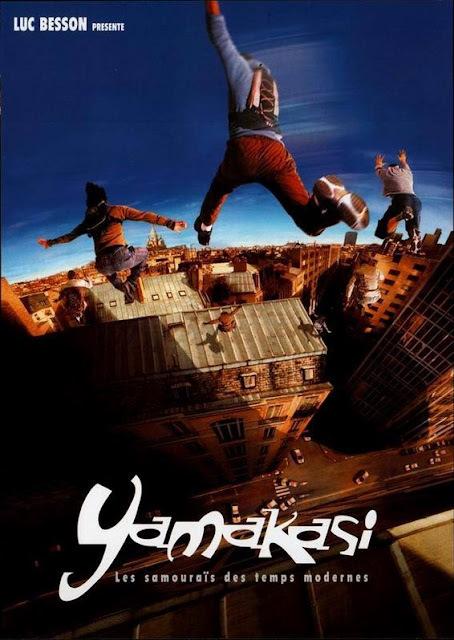 Chrichton's World: Review Yamakasi - Les samouraïs des temps modernes (2001): One of the better Parkour films! Review Yamakasi - Les samouraïs des temps modernes (2001): One of the better Parkour films! Yamakasi is an interesting Luc Besson production as it is a little too ambitious for it's own good. Make no mistake the main draw very much is the sport / philosophy Parkour. But to make it a little more mainstream and conventional Luc Besson has thrown in a story to give it some more meat. In some aspects this is admirable and in some ways it is not at all. I liked how this film tried to add a a little social commentary although at the same time I wasn't happy with how they resolved the issues raised. Especially since it gave the wrong message. On an emotional level very understandable of course however realistically speaking this would only confirm some of the stereotypes that exist in the world and wasn't the whole point to evoke sympathy for the cause of these Yamakasi. The Yamakasi in this film consist of the original founding members of Parkour excluding David Belle (Banlieue 13, Banlieue 13: Ultimatum and Brick Mansions) and Sébastien Foucan (Casino Royale). After one of their big stunts a little kid Djamel feels inspired by them and tries to mimic their movements. He climbs a tree and then falls from it. Apparently Djamel has a severe heart condition and all this excitement has worsened his health so much that if he does not get a new heart soon he will die. News of this is too much for his mother and she tries to kill herself. Fortunately the Yamakasi manage to put a stop to that. It dawns on them that they are responsible for all of this and that they will do whatever it takes to help out and make the surgery happen. I will be honest I could have done without this melodrama. It was laid on too thick and feels out of place considering the otherwise very light tone of the film. The Yamakasi devise a plan to steal from the very same doctors sitting in a board that decides who are the most suitable candidates for donor transplants. These doctors aren't portrayed nicely. In fact they are depicted as downright despicable and evil. And yes I do agree that some might be like the ones in this film but come on if they were all like that in real life then a lot of people would have died. Naturally I understand the thought behind this. It's all done to remind us that the Yamakasi are the good guys. Which brings me to the action and the stunts. Now I am not that well versed into the Parkour philosophy but whatever these guys did on the screen was nothing short of amazing. They climb and leap of buildings like it is nothing. I liked it how they also mentioned that they trained very hard to achieve what they can and that it certainly is not something just anyone can do on a whim. Well, I am sure that is meant for the kids who are watching as I as an adult won't think twice of doing what they do. While some Parkour enthusiasts will be a little disappointed that there is more of real Parkour this is still one of the better ones out there. There aren't that many of them made where Parkour is featured so prominently. And only a few of those are exceptional. So certainly one to check out.